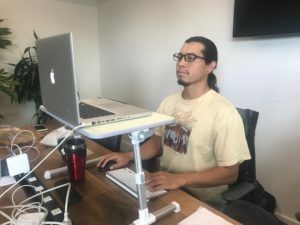 Bad posture while working at a laptop faces 3 obstacles. First, a laptop by design forces you to look down at the screen. The screen and keyboard are attached limiting adjusts to your body position. Lastly, the mouse pad is central causing you to awkwardly pull your arms forward and in. To improve your posture at your laptop you need three basic items. 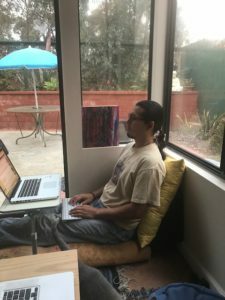 Using three simple tools you can improve your posture and avoid forward head translation. Forward head translation leads to common health conditions such as headaches, neck pain, upper back pain, shoulder pain and poor circulation to your arms and hands. 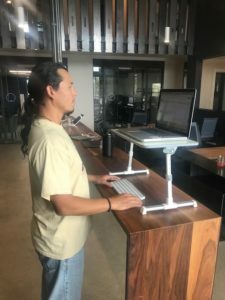 In all scenarios the portable table is high enough so that you are looking at the screen without your head coming forward or tilted down. The keyboard is close to your body allowing your arms to be relaxed by your side. The mouse is positioned just to the left or right or the keyboard.